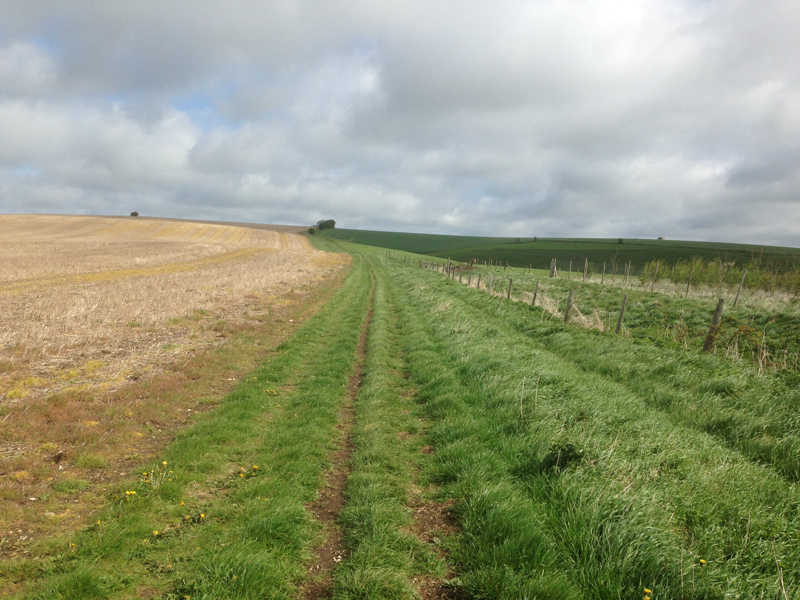 The Ridgeway Walk is a 40-mile challenge walk along the ancient Ridgeway starting from Overton Hill in Wiltshire and finishing at Streatley in Berkshire. Runners are permitted to enter but it is a non-competitive event (i.e. no medals or prizes for positions). The event has been held each year since 1962 and has become something of a tradition for many challenge walk enthusiasts with badges of honours available to those who complete multiple crossings. I first completed the event in 2011 in a time of 7hrs 45mins which involved a bit more walking than I would have wanted and had previously used this event as my last long training run before the GUCR. With the 2013 GUCR entry coming up I wanted to repeat the same build up as a comparison. The plan was a nice long training run at a steady pace without pushing it too hard 2 weeks out before the GUCR. I left my house at 5.30am for the short drive to Streatley, parked up and was ready for the coach at just after 6am. Runners and walkers started to arrive and I spoke to a few people including Glynn, Andy, Lucy and bumped into Tim Adams at the start. Around 6.45am the first of three coaches arrived to transport people from Streatley to the start although people could elect to make their own way their if required. I boarded coach 2 for the 45 minute or so trip to the start although I noticed a few of the runners were on coach 3. Registration was completed on the coach everyone was allowed to start immediately as soon as they had arrived. I briefly organised my gear, started the Garmin and started to run up the path and the first hill and was soon overtaking the numerous walkers. The weather was a little cool and overcast at first but I soon warmed up after a few miles as I continued to jog past the majority of the walkers. The first few miles to Barbury Castle flew by. I was averaging 9m/m and arrived at the first Checkpoint with about 5 people ahead of me. With staggered start times, positions are a little unclear and I knew there would be several runners on the third coach starting behind me. After leaving Checkpoint 1, I was stopped by a few hikers asking for directional advice and spent a couple of minutes looking at their map before heading on. An American guy came flying past me around here as I carried on at my own pace although I passed him a couple of miles later as he stopped to organise his gear and I didn’t see him again. There was one other runner close behind me but I gradually put some distance on him. I arrived at Checkpoint 2 as they were just setting up, waited for my tag to be clipped then pressed on. I was the second person through at this point and don’t recall overtaking anyone else from the first Checkpoint so assume a couple of people ahead of me had gone went astray. I walked up the path of the hill immediately after the checkpoint and then broke into a run keeping up a steady 8-9m/m pace. Here the route was on higher ground and more exposed to the elements, thankfully the wind was at my back pushing me in the direction towards the finish. I arrived at the next checkpoint just to see the lead runner leaving ahead of me, grabbed a drink and some dried fruit and then continued with the steady run. I gradually reeled the lead runner in and passed him as he walked up a hill before the next checkpoint. I’m not sure if the recent hill rep sessions were helping but I felt as if I was trying to run more of the hills than I normally would. From this point, I had passed all the walkers and other runners and was in the very unfamiliar position of being the lead runner. I was assuming that some other runners who started later would overtake me and it really was a non-competitive event but it was pretty cool to be out in front for a short while. I arrived at the half way checkpoint as this was being set up to see Sandra Bowers who mentioned Ian Berry was running today and spoke to her briefly as the marshalls ran to grab the tool to clip my tag to allow me to proceed. 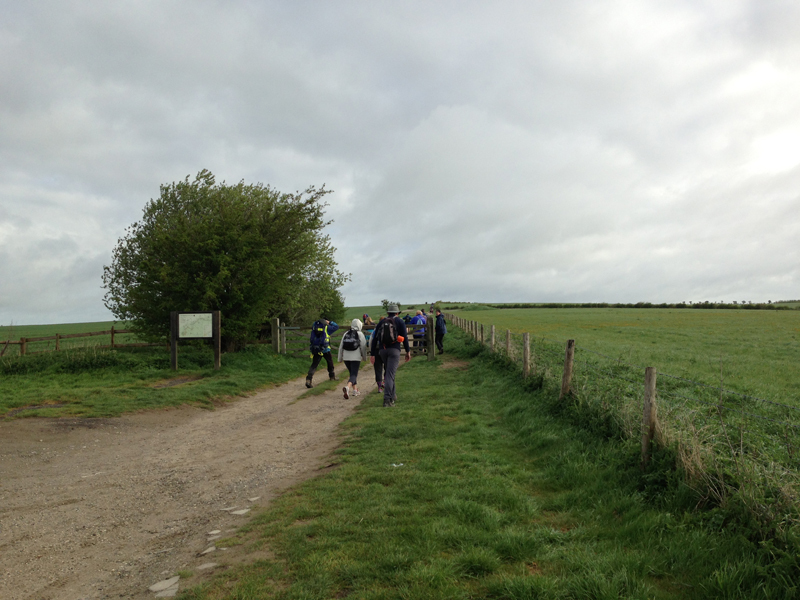 At this point I started to see a few more hikers and learned there was a 20-mile version of the walk which started at the half way point and I started to see and pass more people as the Ridgeway route followed its undulating path in a straight direction. The pace was still sub 10m/m and I carried on although the weather started to get pretty overcast and it started to spot with rain on and off for a few points. I had been wearing my rain jacket from the start and was feeling warm but not too hot although I removed my cap a few times to let the wind cool my head and face. My legs felt ok with a few minor aches but a niggling groin issue was now apparent but I just had to put it out of my mind. As I got towards the last third of the race, Ian Berry caught up with me and we had a brief chat before he carried on ahead of me and eventually disappeared into the distance as I slowed to a walk after a checkpoint and ate some biscuits to refuel myself. At this point I had survived on 2 gels, a pack of shot blocks and some sliced oranges at checkpoints and felt as if I needed to get a little bit more food into the body. The lead (and possibly only) 20 mile runner Mike came past me and I latched onto his steady pace to get me running again and we chatted briefly as we continued along the Ridgeway towards the next checkpoint moving at a little over 10m/m pace. The route was now starting to become very familiar as we had now entered the last of the leg of the Winter 100 and I started to tick off the landmarks as we arrived at the next checkpoint.. including the point I threw up at the Winter 100! I didn’t tarry here and ate some more orange slices and a small chocolate bar before heading on leaving Mike to grab some more food. There were now only 6 miles to go and 1 more checkpoint and I continued along the undulating path at a steady pace although I walked more of the uphill sections now. The last couple of miles follow a steady downhill path which was welcome although I did need to mentally force myself to keep running when I slowed to a walk on a few occasions. It was around here that I started to look at my Garmin to calculate a finish time. I had kept the Garmin on the map mode for the run to track my progress but the Ridgeway route was actually pretty straightforward. With about 3 miles to go I was just under the 6 hour mark approximately so was looking at around a 6.30 finish. 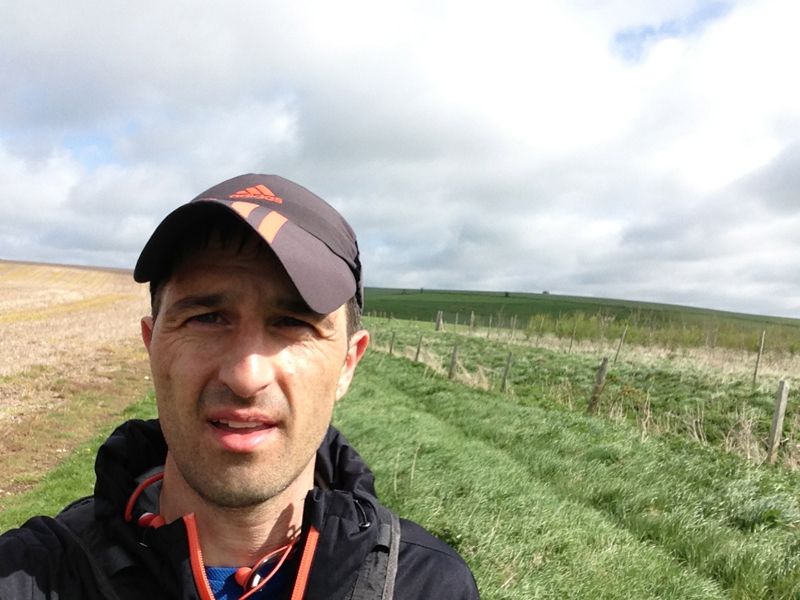 I plodded the last few miles following the downhill stretch from the Ridgeway onto a long road before finishing at the Youth Hostel where Ian Berry had finished and was waiting at the end. I went into the room to record my finish time. My Garmin finishing time was 6hr 23mins but this may differ slightly from the “official” recorded time by a few minutes as this started when we exited the coach and I spent a couple of minutes organising myself before I started my Garmin. I was the second person to arrive back behind Ian (who had started half an hour after me and had a healthy buffer of time on me to be fair) although a few more people had started to finish so with later start times my position may slip down the results table by a few places. Overall I was pretty pleased with the result, I took over half an hour off my 40 mile PB time at Compton a few weeks ago and finished the event 1hr 20mins quicker than 2011 and banked my last long training run before the GUCR. I think my pacing for the event went quite well as this was pretty steady throughout. 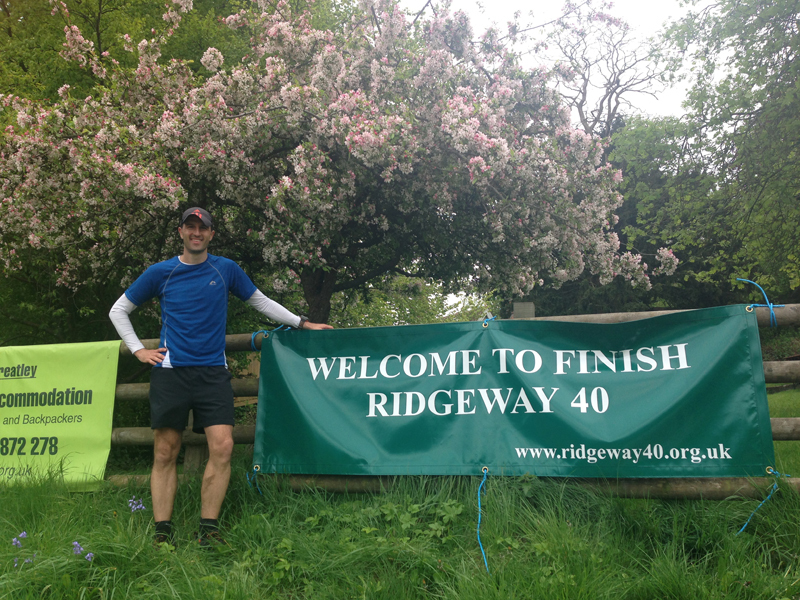 Despite being primarily a walking event, the Ridgeway 40 is a well organised and inexpensive event along a scenic route and well worth running. However if you are a quick runner (I say that as they were just about ready for me and there are many people who would be quicker than me) then there is a slight risk that checkpoints may not be completely ready for your arrival.